This eBook makes colour photography simple, reliable and stress free. The first step in any colour photography workflow is to shoot images that are correctly exposed and White Balanced, because this can save hours in post production, while delivering huge benefits in image quality. Imagine what it would be like if you knew exactly how your images would appear because you had a fully colour managed workflow. Display calibration should be at the centre of your colour workflow, so we show you how to obtain optimal results on your computer and tablet devices with added information about i1Profiler, ColorMunki Photo, basICColor, ColorTRUE and SpectraView II. Your colour images will never be accurate or consistent until your display is calibrated and profiled according to industry standards. Luckily this is easy to achieve with the right knowledge and doesn’t have to cost a fortune. Discover how to set up a correct working environment, either at home or in the studio with practical solutions to ensure your colour perception is not influenced by your work area. From choice of room lighting to wall colour and the desk area; there are simple steps that can drastically improve the speed & accuracy of colour editing. Filled with information based on real world experience, so you can prepare your images for the web, photo labs, inkjet printing or even dealing with prepress printers on the other side of the world. All of this can be done reliably and consistently because good colour management makes it possible. This PDF eBook is available for immediate download and formatted for easy viewing on computer or tablet devices with links to websites plus extra content. As an added bonus it comes with 1080 HD video tutorials. 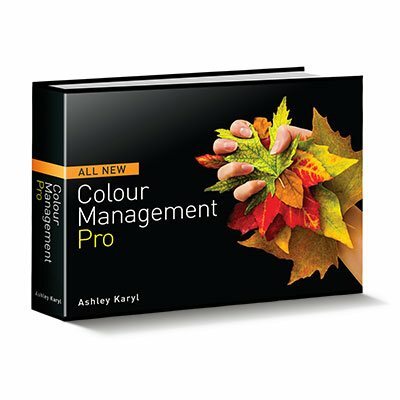 Join the thousands of photographers, designers and others who are already benefitting from this information, because effective colour management is the single best investment you can make in photography. What sort of calibrator do I need? When do we need the printer driver? A brand new eBook with HD videos offering practical guidance on colour management plus information for using Photoshop, Lightroom, Capture One Pro, Elements and Pixelmator.